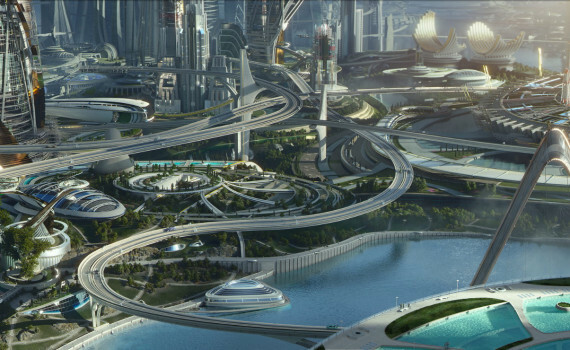 Tomorrowland is a film that relies heavily on two real life venues: the 1964 New York World’s Fair and the Tomorrowland area of Disney theme parks, which first opened in 1955. The movie takes these sites, adds in a little extra imagination, and brings a fictional story to life that revolves around the concepts you could see at these places. Problem is, they were really cool & exciting in the 50s & the 60s. Since then, we’ve all seen the future imagined a thousand times in countless books, TV shows, and movies, leaving us a little harder to impress. Back in America’s booming post-war era, it seemed like anything was possible, that technology was a ball rolling downhill, gaining enough speed to launch our country into another galaxy. But now, we’re a jaded people, a group that seeks instant gratification, a mob of cynics is so many ways. And while this film understands that and gives us those characters, it also tries to paint a brighter picture, a tale of hope that comes straight out of Leave It to Beaver and Mary Poppins. It’s a positive message, but we’re quickly becoming a negative species, and so this film might be about 50 years too late. This is a story of two opposite characters and two opposite lands. First we have Frank Walker, who, as a boy, was shown a different dimension in which the brightest minds of our world were creating an advanced society, not just technologically, but culturally as well, a utopia where all would be welcome. Well, that didn’t quite go as planned, so now Frank is a grumpy old outcast who can only watch as the Earth and her people crumble around him. Casey Newton is a special girl, someone who is as smart as she is determined, a optimist to the end. When she discovers this beautiful possibility of a world, she knows that it’s up to her to make it a reality. But it won’t be easy. 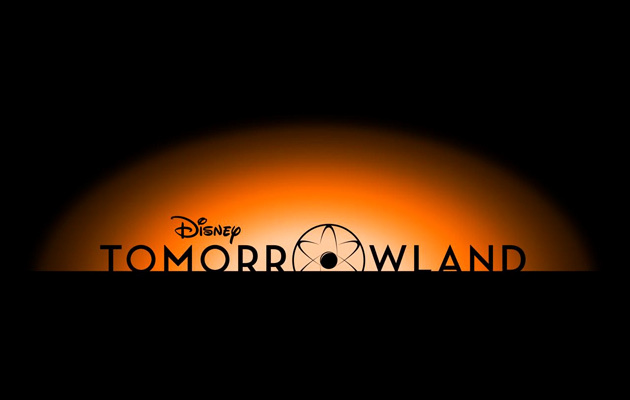 The geniuses & artists of Tomorrowland have closed the doors, knowing full well that Earth is destined for destruction. And while this stops Frank from realizing his dream, it won’t stop Casey, a girl who is too stubborn to quit. She will try to change the world in a matter of days, mostly on her own, and with no hope of success, daring to believe in a better future. Perhaps I was too negative in the first paragraph, and I’m sure not everyone is as jaded and cynical as I am, but the fact remains that our current age is a much different one than our parents experienced in the middle of what would become a tremendous century of change. We’re less excitable now, more worldly, not as easily impressed, and interested in taking care of ourselves in a way that’s so different from the community feeling that pervaded other decades and might still be felt in other regions. Again, perhaps you’re different, perhaps you’re positive, and there are definitely people out there who make a difference every day, be it large or small, but the world, and specifically America, has changed dramatically in the last 50 years. This film attempts to recapture some of that lost hope, that child-like optimism, bringing it to us as something that hasn’t been lost, but rather misplaced. I won’t be the person that says that change is impossible, but I feel like this sentiment is one that has come too late, will be met with too much skepticism, and will ultimately fail to move us in the way it might once have done. OK, let’s move on to the movie. If I thought that the theme was a bit juvenile and misguided, the film was even more so. I think you’d need to be either 12 or 65 to really enjoy the story, to fall in love with the characters, and to appreciate the hope that the film is trying to bring to our lives. The rest of us, or, again, maybe it’s just me, might be too far gone to believe in the sentimentally of the ideals the movie tries so hard to get across. I found myself agreeing with the villain more than the heroes, which I took as a very bad sign. Who was the target audience for this film? I love Disney as much as the next guy, but I never felt like the story was made for me, that it could only be accepted by the open minds of the youth or the nostalgic ones of Baby Boomers. And even then, you’d have to be willing to let a bit of bad acting slide, try not to focus on the myriad of plot points that were spinning around the central theme from the very beginning, and pretend that you were impressed by the scenery, when, really, you’ve seen better. If I try to look at this film through the eyes of someone younger, someone more hopeful, someone who didn’t just watch Mad Max and Ex Machina, I start to appreciate what the filmmakers were trying to do. This movie wasn’t specifically made for me, or probably for you, but it might just inspire a select few to try to change the world. I doubt it can be done, but does it hurt to try?